Born in Ghent in 1966, Diederik Suys studied with Ervin Schiffer and Andre Gertler at the Royal Conservatory of Brussels and the Queen Elisabeth Chapell before perfecting postgraduate at the National Conservatory of Paris with Gérard Caussé. Having received numerous awards in national and international competitions such as Dexia Classics, Tenuto, Maurice Vieux, Nicanor Zabaleta, Maurice Ravel and Lionel Tertis he then successively incorporates several orchestras including the Orchestre National du Capitole de Toulouse, Ensemble Intercontemporain and the National Paris Opera Orchestra where Diederik currently holds the position of principal viola. 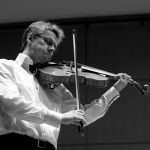 As a chamber musician Diederik is a demanded partner and played with internationally renowned soloists such as Bruno Pasquier, Christian Tetzlaff, Pierre-Laurent Aimard, Toots Tielemans, Marco Rizzi, Jean-Claude Vanden Eynden, Véronique Bogaerts, Itamar Golan, Lorenzo Gatto, Sébastien Walnier, Oxalys Ensemble, Via Nova String Quartet, Soloists of the National Opera of Paris etc. Diederik Suys teaches the viola and chamber music at the “School of Arts” in Ghent.